Turkey jerky is making a name for itself as a healthy snack alternative. But is it really healthy, and is its nutritional value much different than that of beef jerky? The answer depends on the brand you buy and how it's made. In most cases, turkey jerky is a healthy product. It's a low-fat, low-calorie, high-protein food, but many factors impact nutrition. Turkey jerky is made from strips of cooked turkey meat that is seasoned and dried. Cuts of meat, added sugar, seasoning amounts, and sodium vary by brand. 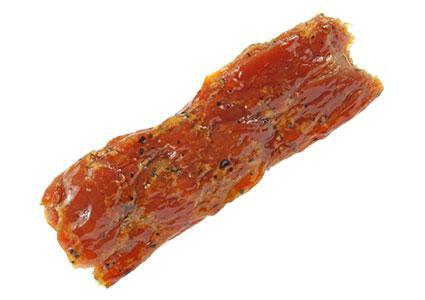 Some jerky is glazed, which adds sugar and calories. Keep this in mind as you consider nutrition value. On average, according to Calorie King, a one-ounce serving of free range turkey jerky has 100 calories, 1 gram of fat, and a whopping 19 grams of protein. These are healthy nutrition facts; however, a serving of turkey jerky also has 270 mg of sodium and 50 mg of cholesterol (white meat turkey jerky has less). The recommended daily allowance (RDA) for sodium is 2,300 mg, while choesterol is 200mg. If you eat a few pieces of turkey jerky a day and other foods containing sodium or cholesterol, you can easily exceed the RDA. Again, these numbers are general. Some brands contain more or less sodium and cholesterol. Turkey jerky is thought of as a healthier option than beef jerky. While it is lower in fat and calories, it's not a significant difference. For example, a one ounce serving of Mountain America Beef Jerky contains 107.3 calories and 3.2 grams of fat. Its turkey counterpart has 97.6 calories and 3 grams of fat. Cholesterol levels are comparable too. Mountain America's turkey jerky has 33mg and beef jerky 34mg. Both beef and turkey jerky are high in protein. Turkey jerky usually comes in a couple grams higher, but the numbers aren't too far apart. There's only a little over a gram difference in Mountain America's beef and turkey jerky. Beef jerky wins over turkey for iron content. On average, beef jerky provides about ten percent of the RDA and turkey between two and four. Some turkey jerky has added preservatives, monosodium glutamate (MSG), and nitrates. Flavored jerky has added sugars. For many people, these added ingredients negate positive nutrition values. When buying turkey jerky, opt for natural brands. One way to be certain about the ingredients in your jerky is to make your own. If you eat all-natural varieties made from turkey breast in moderation, turkey jerky has a place in a healthy eating plan. It's a portable, high-protein snack that is a better option than most processed snack foods. However, as with any food, read nutrition labels carefully so you know exactly what you're eating.